The mine is named for a mercury mine in (old) Almadén, Spain, which had operated since at least Roman times. (See Heritage of Mercury. Almadén and Idrija.) The term Almadén, meaning "the mine", is derived from the Arabic language through medieval Islamic Spain. In 1863, acting on information that title to the mine had not been proven, Abraham Lincoln attempted to seize the mine, but the federal agent and deputy federal marshal were met at the mine gates by armed miners. Mindful of the possibility of losing the loyalty of California during the Civil War, the federal government backed off and Barron, Forbes Company was allowed to sell it to American investors for $1.75 million. Arthur De Wint Foote worked at New Almaden in the late 1870s under James Butterworth Randol. Representations of historical life at the New Almaden Mine were drawn in vivid detail by Mary Hallock Foote, the wife of Arthur DeWint Foote, the resident engineer from 1876. Her illustrated correspondence about New Almaden, "A California Mining Camp", appeared in the February 1878 issue of Scribner's Monthly. New Almaden also features prominently in her memoir A Victorian Gentlewoman in the Far West, which was later fictionalized by Wallace Stegner in his novel Angle of Repose. The mineralized area in the Almaden mining district where the New Almaden and the nearby Guadalupe mine are located is within the large Franciscan Assemblage associated with the Coast Range. Quicksilver ore deposited by hydrothermal deposition of cinnabar from deep within the earth is found in a gangue of silica-carbonate rock formed locally by hydrothermal alteration of serpentine. The Guadalupe mine produced about 10% as much mercury as the New Almaden. There are several smaller mines in the mining district, but their ore production was not significant. The only significant quicksilver ore is cinnabar; other sulfides are present in small quantities. Mining, other than a single placer deposit of cinnabar, was underground. There is a high probability of undiscovered high-grade ore which could be found and exploited using modern techniques. Mining operations resulted in mercury pollution of the Guadalupe River and South San Francisco Bay, impacting birds and aquatic species. In 2005 the responsible parties, which include private companies and local government agencies, agreed to a legal settlement of approximately US$6,750,822 for restoration projects. The California Department of Fish and Wildlife and the US Fish and Wildlife Service issued an environmental restoration plan for the area in 2008. The entrances to the mines are closed off. After being identified as a Superfund site and after subsequent containment activities, the mining area can now be visited as part of the Santa Clara County Almaden Quicksilver County Park. It was declared a National Historic Landmark in 1961. By the time Santa Clara County bought the mines in 1976 and ended operations, 1,137,727 flasks totaling 83,974,076 pounds (38,090 metric tons) of mercury (worth more than US$70 million) had been extracted. The remains of a variety of structures left over from the 135 years of mining activity, including housing for the up to 1,800 miners, are scattered about the park, with the biggest concentration at what was known as English Camp, established by Cornish miners in the 1860s. Some structures were built later by the U.S. Army Corps of Engineers and there is a memorial honoring the Civilian Conservation Corps firefighters who were stationed there for a time. Two California Historical Landmark markers honor New Almaden Mine: #339 marks a cinnabar hill where Indians gathered pigment for paint, while #339-1 is near Arroyo de los Alamitos Creek where the actual mining of ore first occurred. There is also a museum adjacent at the site. Almaden Quicksilver County Park is a 4,147 acre (17 km²) park that includes the grounds of former mercury ("quicksilver") mines. The park's elevation varies greatly: the most used entrances (on the east side of the park) are less than 600 feet (183 m) above sea level, while the highest point in the park is over 1,700 feet (518 m) above sea level. During the coldest storms of the winter season, it is not uncommon for the high summits to receive a light dusting of snow (which usually melts by noon). The park is owned and managed by the County of Santa Clara and its grounds also include the Guadalupe Reservoir; adjacent to the park is the Almaden Reservoir. The Casa Grande Almaden Quicksilver Mining Museum is located nearby. The New Almaden Quicksilver Mining Museum is located in the Casa Grande (big house) at 21350 Almaden Road in New Almaden. La Case Grande, an 1854 revival-style mansion designed and built by architect Francis Meyers, was the official residence and office of the mine superintendents, as well as a country retreat for wealthy mine investors. The mansion now serves as the site of the New Almaden Quicksilver Mining Museum, which contains exhibits about the history of mercury mining and the cultural history of the mining communities at New Almaden. The exhibits include a mine diorama of the interior of a mine shaft, mining equipment and technology, a mine manager's office with period displays, and artifacts from Cornish, Mexican and Chinese mining families. 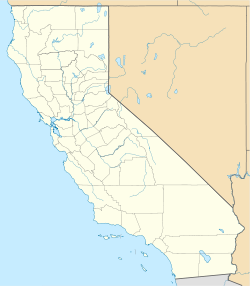 ^ a b "California Historical Landmark: Santa Clara County". Office of Historic Preservation. California State Parks. Retrieved 2012-10-14. ^ a b "New Almaden". National Historic Landmark summary listing. National Park Service. Archived from the original on 2007-11-14. Retrieved 2008-01-17. ^ Snell, Charles W. (April 24, 1964). "New Almaden". Nantional Survey of Historic Sites and Buildings (Revised). National Park Service. ^ "New Almaden". Photographs. National Park Service. ^ "The United States vs. Andres Castillero : "New Almaden" : transcript of the record (1859)". United States. District Court (California : Northern District). 1859. Retrieved January 9, 2015. ^ "THE U.S. SUPREME COURT. ; Decision in the New-Almaden Case--Prize Cases--Close of the Term". The New York Times. March 11, 1863. Retrieved January 9, 2015. ^ Martin Cheek (January 18, 2012) [First published in 2005]. "Lincoln and the South Valley". Gilroy Dispatch. Retrieved January 8, 2015. ^ Leonard Ascher (March 1936). "Lincoln's Administration and the New Almaden Scandal". Pacific Historical Review. University of California Press. 5 (1): 38–51. doi:10.2307/3633317. JSTOR 3633317. ^ Rickard, Thomas Arthur (1992). Interviews with Mining Engineers. Mini. p. 172. ^ Foote, Mary Hallock (February 1878). "A California Mining Camp". Cornell University Digital Library. Scribner's Monthly. pp. 480–494. Retrieved January 8, 2015. ^ "New Almaden Mines". Natural Resource Damage Assessment and Restoration Program. U.S. Department of the Interior. Retrieved 2019-01-08. ^ "New Almaden Mine CERCLA Site". Natural Resource Damage Assessment and Restoration. Sacramento, CA: California Department of Fish and Wildlife. 2018-12-11. Jose Pitti; Antonia Castaneda & Carlos Cortes (December 1988). "Five Views: An Ethnic Historic Site Survey for California / Mexican Americans in California / Historic Sites / Spanishtown Site, New Almaden, Santa Clara County". National Park Service. Retrieved 2008-01-17. 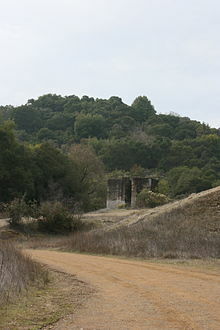 Wikimedia Commons has media related to Almaden Mine, Santa Clara County.